Asian beetles are found throughout most of United States and parts of Canada and is among the highest profile autumn invader in the Midwest. 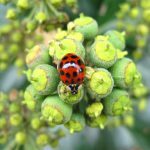 The Asian lady beetle is exceptional in its capacity to damage fruit via chewing, bite humans and produce secretions to which sensitive individuals are allergic. Hand removal of lady beetles from walls, furniture and clothing may result in staining as a result of a yellow liquid being secreted from the leg joints (reflex bleeding) as a defense response. The best solution to invasive lady beetles is the use of preventative physical barriers aimed at adults before they congregate and attempt to enter structures. Asian beetles are most attracted to buildings that are light in color, so changing your exterior color to a darker color will make your home less attractive to Asian beetles. In the fall, these beetles will gather in large numbers on the outside of lighter colored homes. As they gather houses, the beetles will use cracks or holes in the exterior or through faulty window screens to get inside. The Asian beetles are looking for a quiet place like the attic or basement to hibernate until Spring.